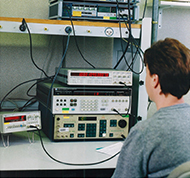 In order to control the quality of its measuring devices, Matra Electronique set up a metrological laboratory in 1991. Since the outset, external customers could benefit of these services. Each year, almost 10,000 inspections, adjustments and repairs have been carried out on the basis of 15,000 active devices. 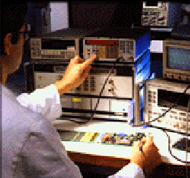 Our expertise relates to electrical measuring instruments (voltage, current, resistance measuring), temperature measuring instruments (-100°C/ +1000°C), hygrometry, time/frequency, super high frequencies (up to 40GHz), NI/VXI/PCI/LXI instrumentation cards representing all types of functions (generator, multimeter, oscilloscope, etc.). 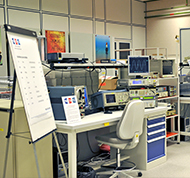 Some “electricity and magnetism” services can be provided in the scope of our “Cofrac” accreditation no. 2.1268 (available on www.cofrac.fr ). 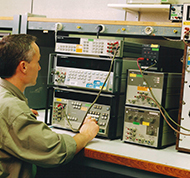 Some technical services can be carried out by taking over the complete management of the customer’s instrument fleets. Our high-quality service allows our customers to constantly optimise their metrology costs with no management efforts required.